Two years ago, I used to travel on back roads through flooded farm land. Several 200 metre long stretches often featured water up to the car's axles. And although I never traveled faster than five miles per hour, the cumulative effect of driving through flood waters for several months resulted in damaged wheel bearings on our car. 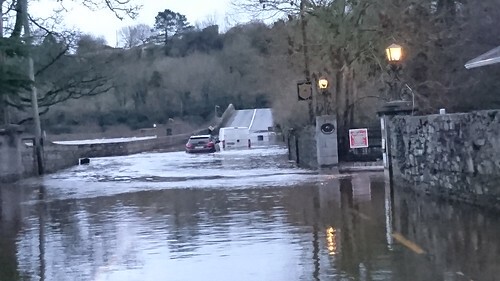 For the past three days, different cars have floundered to a dead stop as they approached Knocklofty Bridge, a few hundred metres from our home. Before they sputter to a halt, they have to pass two sets of warning signs telling them the road is flooded and closed. They also see the rushing water of the River Suir as they drive into it. And few of them actually cross the muddy water from one side of the bridge to another. The water of the River Suir is running fast enough to create white foam as it gurgles between opens in the walls between walkways and pastures. Under the surface, small objects flow with the current. Those sticks, broken bits of plastic, and remnants of fences can get tangled underneath low-slung cars as they try to drive through the river water. We see farmers on tractors and JCBs making their way through these flood waters, sometimes to rescue people who ignore the signs or who feel compelled to get to their destinations. During the Christmas holidays, I've chatted with several people who had travelled hours from other parts of Ireland, trying to attend family events. The Knocklofty Bridge has long been a landmark along the way. Getting stuck in the remnants of a major winter storm isn't the kind of family memory that most people want to record. I wouldn't want to risk the embarrassment (or subsequent maintenance cost) of driving where I couldn't see centre stripes or road surfaces.